A man walks into a small Talent agent's office. He tells the agent he's just seen the most amazing act, and that he should sign this family to a contract. So begins the premise of the joke affectionately called The Aristocrats. It also happens to be the basis for the entire movie directed by Paul Provenza and Penn Jillette. One would think that it would be impossible to base an entire movie around this one joke, but it's pulled off with humorous results. C. Every sick and twisted idea anyone can come up with. The punch-line of the joke is that the family "calls" the act The Aristocrats. According to the movie the joke had vaudeville roots, and was later used as a traditional party game for comedians, most famously they played the game at Chevy Chase's house during the early Saturday Night Live days. What's fun about the movie is not only seeing the different variations of the story, but how the joke seems to take on the personality of the comedian. For instance George Carlin's version is appropriately disgusting and foul, while Penn & Teller incorporates a magic trick into the joke, there's even a mime that acts out the entire joke. In essence the joke is a workshop for a comedian's writing, and improv skills. The joke even takes on emotional weight when a famous instance of a telling of the joke is recalled. 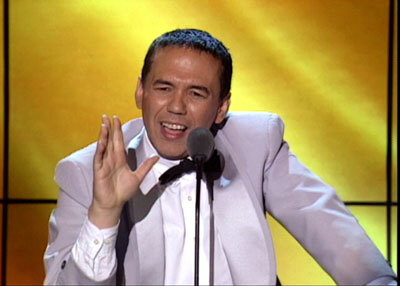 The joke is performed by Gilbert Gottfried, pictured above. What's unique about the event is that it was told at a roast for Hugh Hefner.......shortly after the events of 9/11. The evening was going badly, when Gottfried decided to use the joke. What makes it remarkable is that he was telling the joke to a room full of comedians.......who already knew the punch-line. But because of the timing, and the need for people to laugh during that tough period of time, the joke became a rallying cry. He ended up leaving the entire room in stitches. The movie is an interesting documentary about comedians and what makes them tick. What's fascinating about the film is that through the one joke, the viewer gets a peek into the working process of some of our most famous entertainers. There's bits by Drew Carey, Robin Williams, Howie Mandel, Jackie "the joke man", surprisingly Bob Saget tells a funny version of the story. There is some genuine good laughs in the film, sometimes not even involving the joke. I'm sure some viewers will get tired of hearing the centerpiece joke, but it's interesting to see how comedians bond around the piece. The film is also only 89 minutes so it's a fun, little, quick, flick to throw on for a cheap laugh. If that's not enough the DVD has a bunch of extra footage of the performers telling the joke with their insights. If one wants to get an idea of what it's like to be in the head of some of our most famous comedians this is a good place to start. The movie arrives on DVD January 24th.